Click here to become a MCD Subscriber. The International Market Cycle Dynamics Letter provides a quarterly review of all the key stock market cycles. Important market timing and price support and resistance is identified for buying and selling opportunities for investors and traders. The letter comes in a 24 page PDF download format with full color charts and commentary. Market Cycle Dynamics is pleased to serve a wide range of subscribers including U.S. and global individual investors, investment advisors, money managers, hedge fund managers and high frequency traders, from dozens of countries around the world. Cycles in major U.S. markets, specifically the S&P 500, other developed country markets and emerging markets are covered in the letter and on the website. 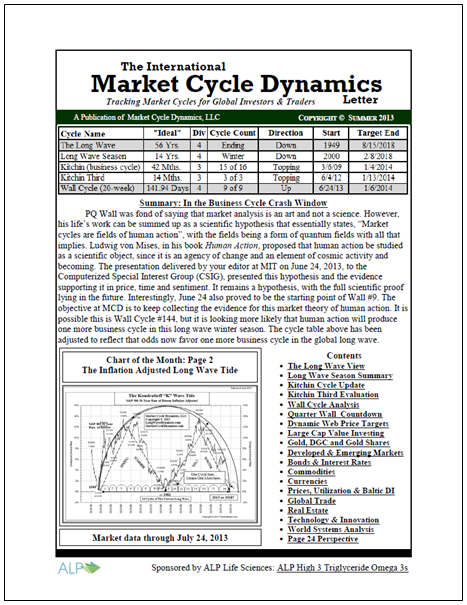 A subscription to The International Market Cycle Dynamics Letter is ONLY $144 U.S. dollars annually. Stock Market Cycles: Front page summary chart of all the cycles in every issue. Long Wave View: Long Wave perspective on the global economy and markets. Long Wave Season Survey: The current Long Wave winter season developments. Kitchin Cycle Update (aka Business Cycle): The investor’s most important cycle. Kitchin 3rd Cycle: Reviews the the Kitchin 3rd cycle that contains 3 Wall cycles. Wall Cycle Analysis (aka 20-Week Cycle): The essential cycle for traders. Quarter Wall Countdown (Trader’s Cycle): Tracking the QW nails the Wall cycle. Fibonacci price analysis: Price grids locate price support and resistance. Value Investing: Value stocks based on value screen parameters. Gold and Gold Stocks: Analysis of Gold, XAU Chart and global gold shares. Developed Markets: Reviews global market indexes and developed countries. Emerging Markets: Key emerging market cycle and grid analysis. Bond markets and interest rates: Long Wave interest rate charts and analysis. Commodity Market Review: Analysis of the CRB index and major commodities. Currencies and Global Trade: Currency and global trade trends. Prices, Utilization and Baltic Dry Index: Essential cycle data review. Political and World Systems Analysis: From a large and small cyclical viewpoint. Perspective: DKB thoughts on a financial, political or philosophical topic. MCD Subscribers also receive access to The MCD Monthly Briefing Blog posted before 11 PM EST the first Wednesday of every month. The MCD Monthly Briefing Blog is must read for market traders in an online post format. Tracking the market action of the Quarter Wall Cycles and the Fibonacci price grids and targets is essential for traders. The date and price turning points reviewed regularly in the The MCD Monthly Briefing Blog demonstrate the remarkable power of market cycles and Market Cycle Dynamics approach to market analysis. The International Market Cycle Dynamics Letter is published and available for download mid-January, mid-April, mid-July and mid-October. MCD subscribers receive access to The MCD Monthly Briefing Blog, posted and available the first Wednesday of ever month by 11:00 PM EST. RSS feeds are available to notify subscribers when the newsletter and weekly updates are posted. Bulk email is undependable, so RSS feeds are used for MCD publication notice. Subscribers also have the option of checking the website for the latest monthly letter and blog post. The RSS sign up links can be found at the bottom of the pages for viewing the letter and the blog. MCD Subscribers also have access to resources and tools on the Long Wave Dynamics website. The tools include Fibonacci support and resistance price grids and date forecasting tools for each of the key stock market cycles updated regularly. New subscribers have immediate access to the current issue of The International Market Cycle Dynamics Letter and The MCD Monthly Briefing Blog, and all back issues. Market Cycle Dynamics, LLC employs the third-party payment processing system provided by PayPal because it represents one of the most respected, trustworthy online payment systems available. The PayPal transaction system automatically encrypts your confidential information using the Secure Sockets Layer protocol (SSL) with an encryption key length of 128 bits (the highest level commercially available). After completing the PayPal credit card payment process, you will have immediate access to the MCD Subscriber only section. PayPal requires you to provide your email address together with your credit card information. It is important that you provide a valid email address. PayPal is going to send payment confirmation information to this email address. Your credit card payment is going to be processed on the secured PayPal website. No credit card information is transferred back to Market Cycle Dynamics, LLC, but only payment status, email address, first and last name. After your payment has been processed by PayPal you are directed back to the MarketCycleDynamics.com to get instant access to the MCD Subscriber only section with access to The International Market Cycle Dynamics Letter and the MCD Monthly Briefing blog.